What better way to add to your gluten-free holiday baking menu than incorporating an easy, delicious, no-bake GF dessert? Our Chocolate Truffle Pudding Pie is the ideal way to indulge over the holidays (or even on a Tuesday) and feel more or less guilt free! And can we mention it’s full of rich silky chocolate, warm toasted coconut…..and healthy avocado? Yes, you heard that right! If you’re not familiar with the classic combination of avocado and cocoa, often used for healthy dairy-free, vegan chocolate pudding, there’s no better time to try this trick out! I know what you’re thinking… avocado as a dessert? Know that avocados take on the flavor of what you mix them with which is why marrying a good quality cocoa powder with perfectly ripe avocado acts as a great base for creating a multitude of wonderful raw desserts such as our Chocolate Truffle Pudding Pie. 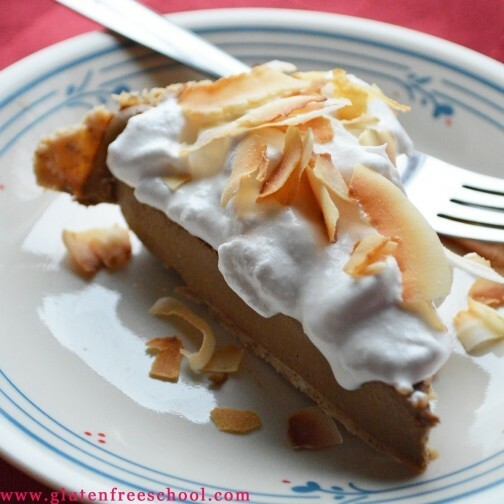 Full of nutrient dense ingredients like avocado, coconut milk, coconut oil, and pure maple syrup, this pie is vegan and free of gluten, dairy, soy, peanuts and refined sugar. And it’s as easy to make as throwing ingredients into a food processor or high speed blender. 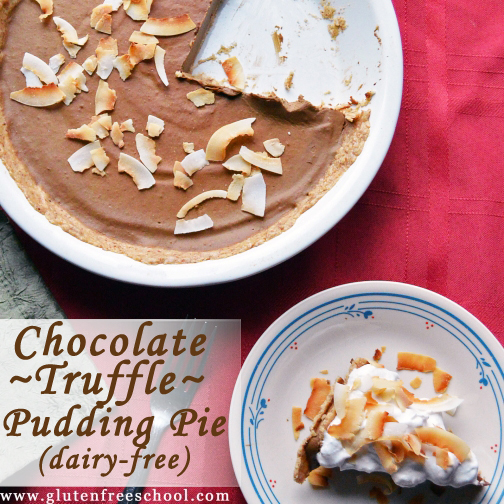 Not only is the filling of this chilled pudding pie made of healthful naturally delicious ingredients, the raw sunbutter crust is just as awesome. Using the incredible Sunbutter Drops recipe by Laura Pappas, we simply made a crust by pressing the raw “dough” into a pie pan and chilling it, instead of rolling it into little individual “drops”. For a optional finishing touch to top off the pie, add a heavenly layer of whipped cream! Go the paleo route by whipping up a chilled can of coconut milk or try the new So Delicious Dairy-free Coco Whipped Topping (that’s vegan, DF and GF) that will put this dessert over the edge–in the best possible way! This Chocolate Truffle Pudding Pie is a slice of silky, chocolatey heaven. With no dairy, refined sugar, or gluten, it's a decadent but guilt-free dessert. In a large food processor or high speed blender, combine all ingredients for the sunbutter crust and pulse until well combined. The mixture will be slightly sticky due to the maple syrup. Place the mixture into the fridge for roughly 2 hours or until it has hardened, but isn't completely solid. (It's much easier to press it into the pie pan this way). Using an 8 (or 9) inch pie pan, distribute the chilled crust mixture evenly around the pan to form the raw crust. Cover lightly with plastic wrap and return it to the fridge until you're ready to place the filling. Combine all ingredients at room temperate in a high speed blender or large food processor and process until smooth, pausing to scrape down the sides to make sure everything is well incorporated. It should be a pudding like consistency. Pour/spoon the chocolate pudding mixture into the chilled pie crust and smooth evenly with a spoon or spatula. Chill in the fridge for 2-3 hours or until firm to the touch. When ready to serve, take the pudding pie from the fridge and wait about 10 minutes for it to soften before cutting slices. Top the entire pie or by the slice with the So Delicious Coco-Whip topping. Sprinkle toasted coconut flakes on top for a great crunch and pretty presentation. Serve while still chilled. Hi Kara, I’ve never tried it with anything but avocado, although I’m wondering if it might be able to be substituted with a very soft tofu. I can’t test it myself using tofu since I’m highly allergic to soy, but if you give it a go with tofu let us know how it turns out! could gelatin be used to create the “set” in the pie filling ?